For each person who utilizes Microsoft Office for much or even the majority of their time at the computer, there is some plugin, (or “add-in”, as Microsoft itself likes to call them), that was made just for them, that fits their activities in the most time-saving manner, and that provides significant gains in the various aspects of user experience. 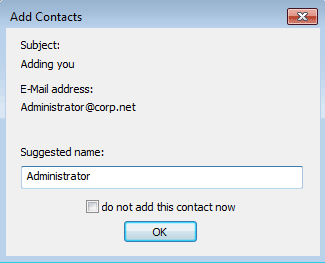 One of such third-party add-in for Microsoft Outlook is Add Contacts by MAPILab. If you often make new contacts and have trouble with email addresses that don’t really offer an indication of the owner’s name, Add Contacts might be the add-in that suits you. The development team at MAPILab did not have to think long before the idea of a quick and smooth procedure to add new email addresses to the user’s Contacts list while working in Outlook came to mind. The demand for features that should have been built into Office in the first place is, in fact, never-ending. Granted, not every email address that comes through your mailbox during your daily activities needs to end up in your Contacts list by default, but surely a feature to allow you to choose without interrupting your work is a welcome addition, especially in some, namely corporate, use-cases. Among other benefits of the feature, it helps greatly with distinguishing which addresses have been previously contacted and which have not. The design is simple: every email address to which you have sent an email or have replied to can be seamlessly added to your Outlook Contacts automatically for further interaction. The reasons for doing this could be as simple as a convenient presentation of the recipient within the fields of messages you compose, or as complex as storing recipients contacted as valuable data which can be used with great success as part of statistical reports. Whatever the reason you or your company might have for implementing it – there is no denying that tracking your recipients – especially if there are large numbers of them – is much easier when the addresses of the people you converse with are stored as Contacts in Outlook. 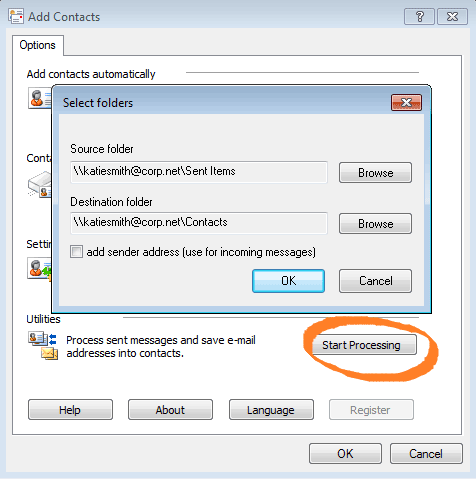 Enabling the “Sent messages” option will tell Add Contacts to process all recipients to whom you initiate a message. The “Replied messages” option will only process those recipients who have already sent you a message to which you are replying. 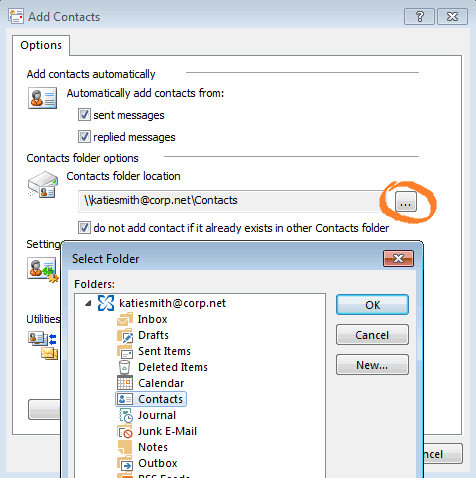 Here you can choose which folder you would like to save your new contacts to, and whether you wish Add Contacts to check whether or not this particular recipient is present as a contact inside some other Contacts-storing folder within your mailbox. 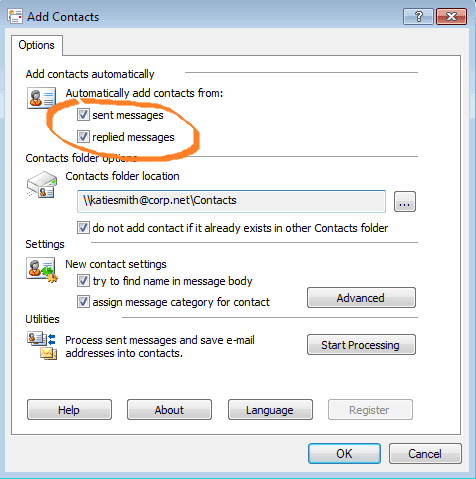 Disable this option if you wish to populate an special-purpose folder for new contacts generated by the add-in. An option to set a specific category is also available – this can keep track of Contacts from the add-on vs. those added other ways. Do you have .msi packages for this so it can be mass deployed? After that, the Wizard will prompt you to specify a location for the .msi. This sounds like a great timesaver and better than Gmail, which saves EVERY ADDRESS to contacts. (I use Outlook PC for personal and Gmail for work.) It sounds like it would work well with Akruto, which I use to sync Outlook contacts with my iPhone and Galaxy tablet. I assume the plug-in simply saves the contact information to Outlook Contacts. And if so, then it should work with Akruto, which would sync the new email addresses with my devices. Yes? 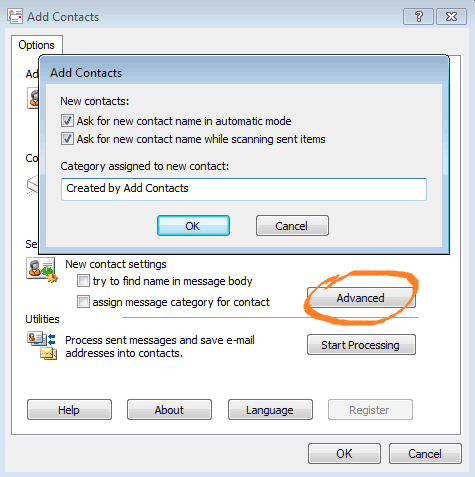 Yes, our Add Contacts add-in saves automatically recipients’ e-mail addresses from your outgoing messages as new contacts to Outlook Contacts folder (senders from incoming mail can be also saved, but you will need to run the add-in manually for that). And your synchronization tool can sync your new Outlook contacts with your devices after that.